Did you know corporations or companies can have a chart? An astrological chart marks the time someone or something is born. In the case of your birth chart, it delineates your life journey but the same principle applies to a partnership/marriage, starting an endeavour or even the birth companies. The birth time for a publicly traded corporation will be when the company has its Initial Public Offering or IPO. The time used to mark the birth of the company is when the stock market opens for the particular market the stock is traded in. For smaller companies, it can be when they hang their shingle up or when they are officially registered as a company. Major events of a company can be timed. In the personal horoscope, you can demarcate when a person will go through financial or identity crises. The same will go for a company, where you can determine when it will go through financial difficulties. The equivalent of a person having an identity crisis, in the case of a company, could be translated as a change in leadership. Astrology can be used to pick the time of events such as that of a new product release. That event will have a birth chart as in the birth of the product. One would not use the birth of the product idea. The idea occurs at an earlier date but that could be referred to as the conception and the research and development and marketing plan can be viewed as the development in the womb but the day it is released to the public is when it is officially born. While the timing of the release is an important factor we must also compare it to and see how that meshes with the company chart. This chart has a few issues with it. The ascendant is Libra which makes Venus the ruler of the chart. The ruler of the chart is in a square aspect which is difficult, to begin with, but it is with the two malefic planets, Mars and Saturn. They are in the fiery sign of Sagittarius. Neptune is also opposed to Venus which can hide and obscure issues. The Mars and Saturn are squaring the Moon’s nodes which suggests this event will change the direction of the company and product. 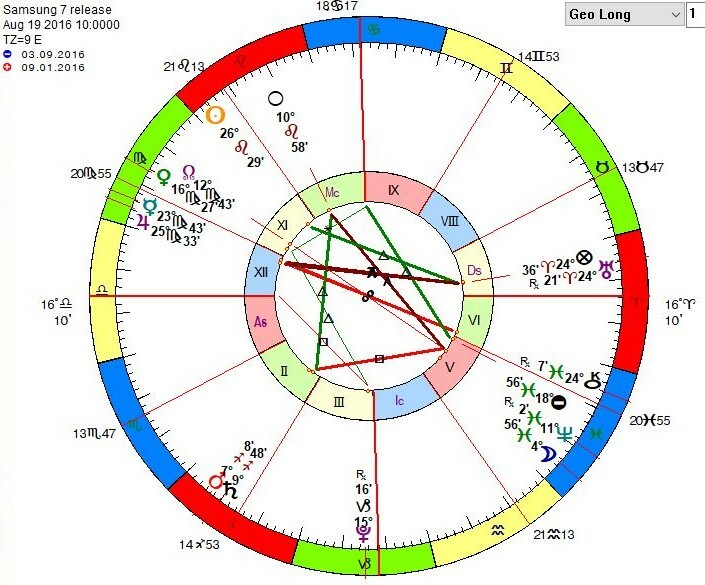 The chart ruler Venus is also on the North node suggesting this will be a highly influential release. Eclipses, if they are not the harbinger of difficult times, will at least bring high-intensity focus to an event. 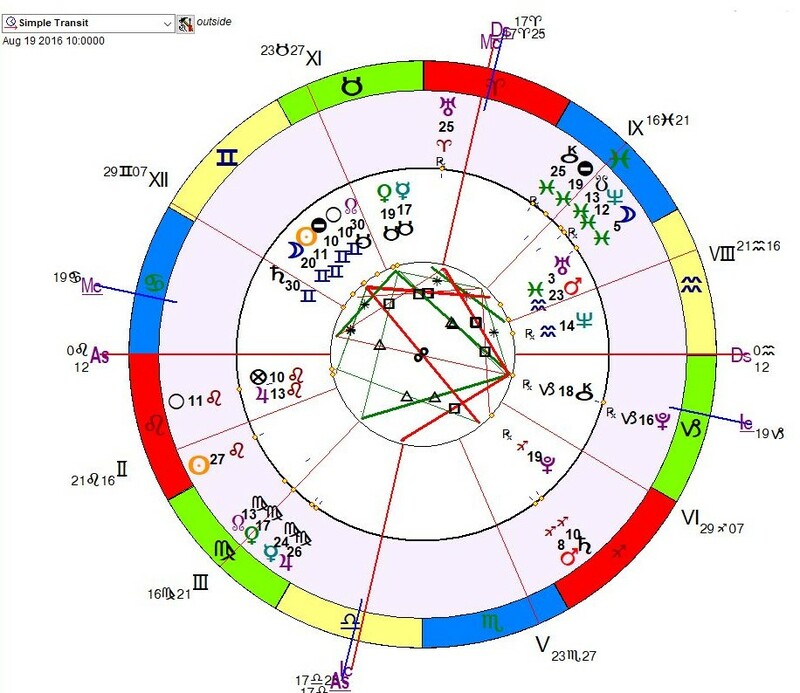 Venus, the chart ruler, is in opposition to the prior eclipse which suggests it also can bring misfortunate, challenging events, or bring events to the foreground. The effect of eclipses generally lasts until the next one which is roughly 6 months. We will now examine the event chart against the chart of Samsung’s IPO. Samsung has existed since the 1930’s, so they obviously have a pre-existing chart but as far as organisations go they will have a new chart as dictated by the IPO which has made the firm a different organisation by both management and guiding factors and regulations. To tell what is going on at any given time in a natal chart, we compare the chart of the day or transit chart to that of the birth chart. This technique allows you to look at events in the past, present and future. When looking at the release date of the Note 7 with respect to the Samsung IPO we can see that malefic Mars and Saturn are opposite the Sun in the IPO chart. This says they suggest the identity, the vitality and heart of the company (Sun of the IPO) is under “attack” by these two planets. Saturn usually amounts to limitations and hardship which require a lot of work and forced restructuring. Mars is more of an assault and arguments and the need to take action. Since they are opposite the Sun of the IPO chart it suggests that at this time Samsung would be going through major difficulties during this period. Since there are difficult transits to the natal planets, would Samsung not experience these same issues regardless of the launch? That is a good question. My answer to that is because they poorly planned the release – a global event, they got the expected results as we have seen. If they waited to release at a more auspicious time then the Saturn/Mars transit of August 19 would have manifested in a different manner. It could have possibly been a slower evolving matter or process that could have been a strictly an internal issue where management (the Sun) went through a process of change because there would not have been an event tied to a particular time. The only public outlet might have been the shareholder’s letters or an announcement in the newspapers. We’ll never know what transpired in the other situations because they picked their path. This is just an example. They say timing is everything. Astrology is all about timing. Why not use astrology as a tool that can help you navigate upcoming events. Most people look to the weather forecast in order to decide what to wear. Those are constantly being corrected as you get closer to the day in question. With astrology, you can know the event happening in the future or at least the flavour of the event and how it will affect you.